Lenz launches The Weekly Check-Up healthcare show in Tampa on 102.5 FM. Lenz recently added to its growing list of media properties with the launch of The Weekly Check-Up healthcare radio show in the Tampa-St. Petersburg market. 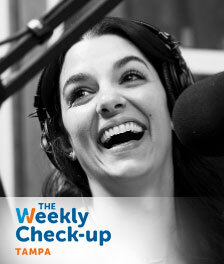 The show marks an extension of The Weekly Check-Up brand, which launched in 2011 with a radio program on 95.5 FM and AM 750 WSB in Atlanta, and is hosted by Dr. Bruce Feinberg and presented by Georgia Urology. In Tampa, The Weekly Check-Up is presented by Florida Cancer Specialists, hosted by JoJo Patrella, and airs Saturday mornings on WHPT 102.5 FM. Additional sponsors include Smart Scan and Dr. William Cooper of the Gessler Clinic. The show can be streamed live at TheBoneOnline.com, and past episodes are available here. https://www.lenzmarketing.com/wp-content/uploads/2017/05/logo-1.png 0 0 Lenz https://www.lenzmarketing.com/wp-content/uploads/2017/05/logo-1.png Lenz2018-03-08 15:23:012018-03-08 18:00:29Lenz launches The Weekly Check-Up healthcare show in Tampa on 102.5 FM.